Also known as ‘The vampire face-lift’, and ‘Dracula therapy’. 55% of blood is made up of plasma. Plasma is a straw coloured liquid rich in platelets, white blood cells, stem cells, proteins, minerals, ions ,growth factors, and chemical messengers; all important for healing and repair. In order to separate and concentrate the plasma, a sample of the recipient’s blood is taken and ‘spun’ in a machine, the red blood cells sink to the bottom; the plasma rises to the top. 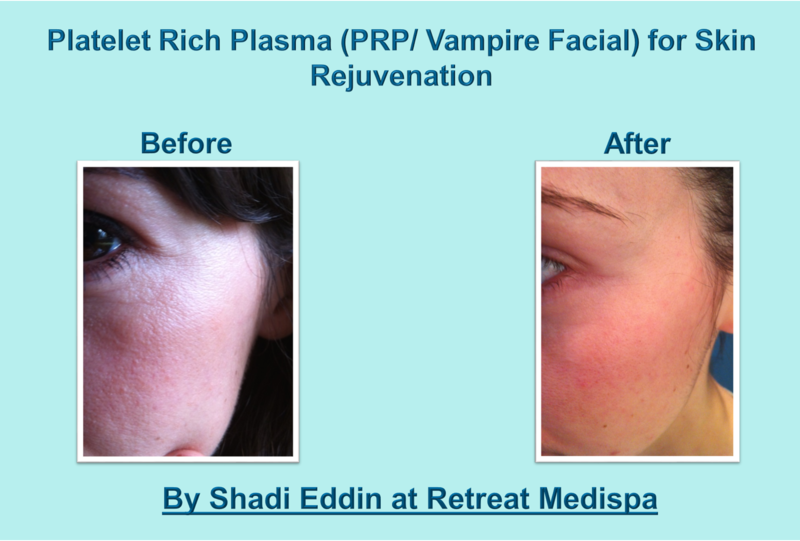 The concentrated plasma contains key components of tissue repair and regeneration, taken from the recipient, PRP is injected into the skin to stimulate the formation of new collagen and elastin. The results develop over a period of months, improving skin tone and elasticity. Results may be achieved after a single treatment, although most clinicians will recommend a review at 6 weeks and 3 treatments over three months to achieve optimum results. *The claims made for this treatment for cosmetic indications are not yet supported by published research (scientific method) that would evidence standards of efficacy for cosmetic indications. Your practitioner will provide aftercare advice designed to minimise risk and promote speedy recovery from any expected side effects. As with any injectable treatment, there may be redness, tenderness, swelling and possibly bruising. Swelling, particularly if treatment is administered around the eyes, may be quite marked in the first 24 hours, and may take up to a week to settle. If, having had treatment, you are at all concerned about symptoms you were not expecting or not happy with, please contact the practitioner for advice. If necessary an appointment will be made for you to be see.